A Kind Like Joey Facebook page with more than 600 members encourages people to share their memories of Joey and acts of kindness that are touching people in countless ways. This Facebook page has received 14,000 points of contact through posts, comments, and reactions. On Tuesday, November 20, 2018 the first event honoring Joey’s memory took place promoted via social media. The #KindLikeJoey day encouraged people to commit acts of kindness in memory of Joey. Students delivered cookies to their classmates, teachers received floral bouquets, strangers were given free cups of coffee, and homeless people were given gifts of comfort all in Joey Edwards’s name. 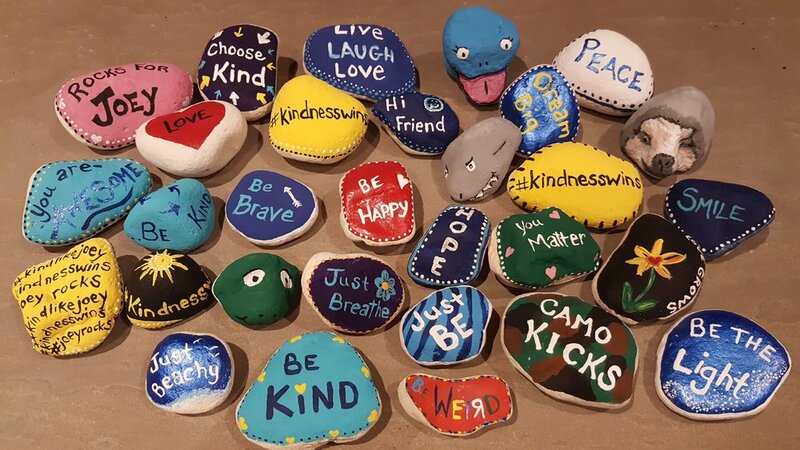 #Joeyrocks have been painted and left throughout the community spreading messages of love, encouragement and kindness. They say Be Kind, Keep Smiling, Keep Shining, You Are Enough, and other reminders to keep spreading kindness. The film class at Central Bucks South High School is creating a video to share Joey’s story. The video will include stories about Joey’s kindness and interviews with his parents and friends. The video will be shared throughout the district through Central Bucks TV and on social media in an effort to raise awareness about performing random acts of kindness and honoring Joey’s legacy. Magnets supporting the cause are currently for sale at numerous locations throughout the Bucks-Mont area. On January 22, 2019, Butler Elementary held an assembly honoring Joey. Joey’s teachers prepared a video describing Joey’s caring and kindness and the impact he had on students, teachers, parents, and administrators throughout the school. The school is committed to and focused on sharing kindness and being #kindlikejoey for years to come. On May 3, 2019, we will hold a Golf Outing in Joey’s honor at PineCrest Country Club in Landsdale, PA For more information, please see our sponsorship and golf signup page. For more information regarding the golf outing, click the links below.